Home	>	Resource Center > Tips for Renters > What Does a Keel Do? The graceful, sweeping lines of a sailboat above the waterline belie the very hard-working and functional part of the boat below the water — the keel. The word keel, which has Norse and Dutch roots, refers to either a structural or hydrodynamic component of a vessel. The information below describes the basic functions of sailboat keels. To ensure that the keel works as intended and that the ballast is in good shape, the condition of the keel should be checked regularly, either during a haul-out or in-water. For charterers considering a sailboat, particularly one of any size, it is prudent to develop an understanding of keel characteristics, ballast type, and other details well before departure. On non-sailing vessels, such as commercial cargo ships, the massive plate that serves as the vessel’s bottom is usually referred to as the keel. Its shape is designed to match the ship’s cargo-carrying needs or special use and provides hull strength. Some cargo and cruise ships are built with a longitudinal keel, commonly called a flat plate, attached to the hull at an angle and running parallel to the ship’s deck, to provide greater directional control and stability. On smaller vessels, such as trawlers, tugs, or ferries, a bar keel is often attached to the hull and serves the same purpose. Recreational powerboat hulls are generally flat and do not have keels. During ship construction, “laying the keel” is typically the first component to be built and, according to nautical tradition, is a momentous occasion, usually marked with a ceremony: the ship’s life is dated from this event. Only a ship’s launching is considered more significant. All sailboats have a keel, centerboard, or dagger board. Generally, on larger boats, the keel is an elongated, blade-like structure extending from the hull bottom, mostly perpendicular to the boat’s deck, and is an integral structural part of the vessel — it provides counterbalance, lift, controls sideways movement, holds the boat’s ballast (typically lead, sand, or water) and helps prevent capsizing. Keels can be fixed or moveable and may retract or be completely removed for shallow-water sailing. When a boat “heels,” or leans to one side or the other, the keel and its ballast counteract the sideways force, preventing the boat from completely tipping over. The two most common keels on recreational sailboats are the full and the fin. A full keel, more likely to be fitted on blue-water sailboats, is much more stable than a fin keel, but slower, and more difficult to maneuver, particularly in close-quarters. Near-coastal and racing sailboats are usually equipped with some version of the fin keel. Conversely, the fin keel is comparatively smaller. Its size offers less water resistance and therefore provides higher speed. Other types of sailboat keels include the long fin, bulb fin, and swing keel. Hybrid keels with bulbs typically carry ballast in the bulb. Recreational sailboat ballast is commonly encased in fiberglass and attached to the boat’s hull; in this arrangement, the weight is spread throughout the keel, not just at the keel bottom. 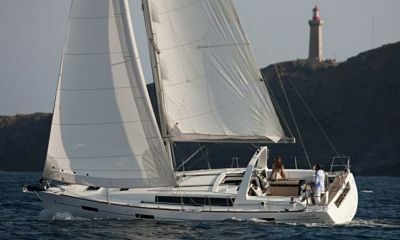 Catamarans typically do not have keels; some may have daggerboards that serve the same function as a traditional keel. Four forces affect a sailboat while underway. The two that directly affect motion are the force of the wind and the viscosity of the water. The wind propels the boat, and the water viscosity slows it down and the hydrodynamics involved help it maintain the desired course. The other two forces, gravity and buoyancy, also play important roles: gravity pulls the boat down and buoyancy pulls it up, keeping it afloat. Both are critical components in sailing. Sailboat keels use the forward motion of the boat to generate lift, which counteracts the leeward force of the wind and converts the inherent sideways motion of wind in the sails into forward motion. 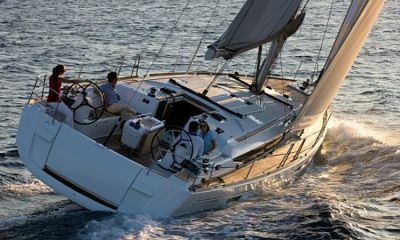 The keel also holds ballast, usually placed at the keel bottom, which helps prevent capsizing. Without a keel or centerboard, a boat would simply move sideways, away from the wind. A well-shaped keel forces the boat forward, while sliding slightly to leeward (away from the wind). When the wind blows across the sails, several hydrodynamic forces under the boat help create lift and allow the boat to recover from tacking. The keel’s broad, flat surface generates a sideways force by displacing water opposite the heeling motion. Although keels have a much smaller surface area than sails, the water density around the keel allows it to exert a force strong enough to counter the heeling motion. While underway on a sailboat, it is important to operate in water deep enough to prevent the keel from running aground in mud, sand, or other material covered by water that is too shallow. Running aground is the bane of sailors in all types of sailboat types and sizes, and happens frequently. The familiar sailing phrase would certainly apply here: “The sailor who claims to have never been aground is either lying, or the boat never leaves the slip.” Grounding can create some potential collision or crew safety concerns, but experienced sailors can recover from most situations with a minimum of boat and ego damage. However, running a boat aground can damage the keel, cause ballast loss and possibly affect the structural integrity of the vessel. Depending on the extent to which keel is grounded, the type of bottom material in which the boat is grounded, boat size and weight, and tide, current, and wind conditions, among other factors, freeing a boat can be an expensive and time-consuming effort. To avoid grounding, sailors should pay close and constant attention to charts for water depth data and shallow water markers. Additionally, they should keep keel depth in mind, particularly in unfamiliar waters, when docking, or during close-quarters maneuvering. Efficient — and fun — sailing is a challenge. Sailors constantly adjust sails, boat position, and on-board weight to find the delicate balance between available wind, tides, currents, and boat characteristics, and use these components to position the boat to travel in the desired direction and in a safe manner. Part of the challenge is to understand how the keel interacts with the sails and to use that interaction to sail efficiently.